Agriculture plays a key role in food security, and in Africa, it is also a crucial economic sector, accounting for 40–65% of jobs. Even as countries urbanize and industrialize, farming is expected to remain an important livelihood for decades to come. Yet because of a high reliance on rainfed production, among other factors, agriculture in sub-Saharan Africa is also very vulnerable to climate change. Governments recognize this, and in their (intended) nationally determined contributions (NDCs) under the Paris Agreement, all sub-Saharan countries identified agriculture as a priority for adaptation action. There is growing interest in the role that private finance could play in supporting those efforts. But while several opportunities for private investment have been identified on the mitigation side – for instance, in renewable energy – the private sector’s role in adaptation in developing countries is less understood. This discussion brief* examines the role of private actors in publicly funded agricultural adaptation projects in sub-Saharan Africa, identifying different types of involvement. The goal is to provide a foundation for exploring ways to expand the role of private actors, and to identify ways in which public climate finance could be used to catalyse and scale up private investment in the sector. *Access the full discussion brief in the column on the right. Interest in involving private actors in climate change adaptation is growing. Sub-Saharan African countries have identified agriculture as a priority for adaptation, and engaging private actors, including smallholder farmers and small and medium-sized businesses, in adaptation projects is widely recognized as essential. The analysis performed here identified 64 agricultural adaptation projects in sub-Saharan Africa approved by five international climate funds and Rwanda’s Green Fund (FONERWA) in the period 2010–2016; of those, 39 (61%) included the private sector. in a much smaller number of projects, public finance is already leveraging private investment. 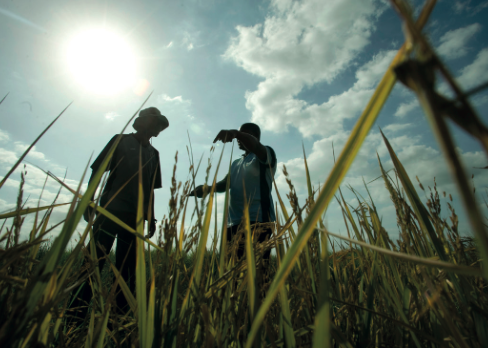 In order to accelerate and scale up private investment, policy-makers in sub-Saharan Africa would do well to provide more clarity on which types of private actors they seek to involve in their agriculture adaptation projects and programmes. Too many agricultural adaptation projects start from the assumption that there are no commercial opportunities, so there is no scope to involve the private sector. This makes it difficult to engage private actors later on. By identifying ways to involve private actors already at the design stage, project developers can create stronger partnerships and more effective mechanisms and incentives to promote further engagement and investment. Commercial opportunities for private actors should be identified along the entire value chain, and not only on the production side. The study found some projects that sought to create pathways for uptake and scaling up of the use of financial products and services in support of adaptation in agriculture. It is important to demonstrate the commercial viability of adaptation strategies, through feasibility assessments and pilot projects. Adaptation funders should consider including private-sector involvement as part of their results, particularly in frame-works that monitor and evaluate outcomes. In view of the interest in getting private actors involved in adaptation, and a lack of transparency of private-sector activity, this information could help in identifying good practices and future opportunities. Canales, N., Klein, R., and Davis, M. (2017) What roles could private actors play in agricultural adaptation in sub-Saharan Africa? Insights from publicly funded projects. Stockholm Environment Institute: Stockholm.